My contribution for Friday Fiction was a story I wrote that is based on an event in my life. (I really did go camping with friends on top of Mt. Chilhowie and we really did pitch our tent in the dark, and well...just read on to find out what we discovered in the morning. Oh, and I got an Editor's Choice for this crazy story!) 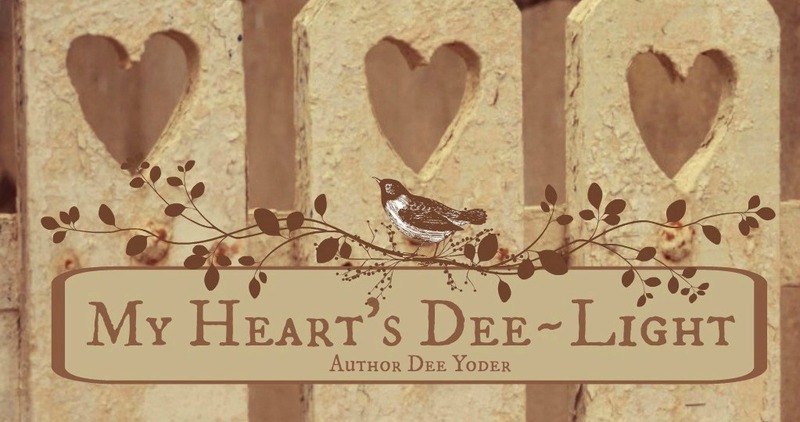 For more entertaining fiction, head on over to Joanne's place, An Open Book. “It’s ten miles from start to finish. It seems longer to you because you’ve never done it before. I warned you it would be too tough for your first hike, but...” he shrugs. The new boots I’m wearing feel like they weigh ten pounds each; I’m pretty sure once I take my socks off, I’m going to find shredded flesh where my heels used to be. I begged to come, but I didn’t know it would be this hard and tiring. I’m grumpy, too. John, being the experienced hiker, has irritated me with his constant advice. He’s turned into Mr. Know-It-All. Before this fiasco, I used to like my husband. “Where are we going to camp tonight?” I ask again as I brush away the bugs. He’s getting very close to becoming a casualty on this trail, I think as I glare at the back of his head. “You don’t have to act like I’m an imbecile, ” I mutter under my breath. Though I’m a novice, I think I’ve done fairly well keeping up with him. Of course, he pointed out to me the many mistakes I’ve made along the way, and this has set my teeth on edge. The emotional distance between the two of us burns my heart. I’d wanted to have time alone with him. I’d imagined conversations, laughter, and even a little flirting on this journey. But it hasn’t been that way at all. I’ve worried him no end in my ignorance, and I’m not happy being told what to do by the “expert”. First, he couldn’t believe I started this hike in brand new boots. Then he was critical of all the stuff I packed in my backpack. When he turned out to be right, and I couldn’t carry the load any more, he’d carried my backpack, too, but couldn’t resist saying, “I tried to tell you.” Grrr. I don’t dare say anything about the condition of my feet. The last hour of the hike we barely speak to each other. Finally, when I think I can’t take another step, he points to a sign that says “Camp Chilhowie.” I moan in anticipation of blissful rest, and as we walk through the campground, darkness settles over the hilltop like a heavy curtain. My mistakes have cost us daylight and, in minutes, I can’t see anything beyond the campfires and lanterns. I stomp my foot in frustration. “John! Can’t I be trusted to even choose a spot without a lecture?” He sighs and gives in wearily. In the glow of the campfire, John starts. I try to help him set up our camp, but I have no idea what to do. I locate a level place and with little assist from me, he pitches the tent; he’s fussing and grumbling the whole time. We finally fall into our sleeping bags in exhausted huffs. So much for togetherness. The sound of John’s Bible pages shuffling wakes me. He glances my way and keeps reading. “Not even a ‘good morning’, huh?” I grouse. I shrug myself out of the sleeping bag and open the tent flap, and when I look out, I gasp. I can see that in the dark last night, I directed John to pitch our tent on the rim of a precipice! Angels must have kept us from hurtling over the side when we stumbled to bed because the path we took is no more than two feet from the edge. “John! Look!” He scoots over to the opening and leans out. His astonished face turns pale and then he bursts into laughter. He grabs his Bible and holds it out to me, his finger pointing to a verse. “Pride goes before destruction, a haughty spirit before a fall*,” I read. I feel my face flush and my heart pound at my foolishness. “Next time, John, I’ll listen and learn,” I promise with a shaky laugh. I wrote this for the Challenge during the Christmas topics. It is based on my dad's childhood and shows the happy spirit he was born with, in spite of his circumstances. More great fiction is at Rick's Pod Tales and Ponderings. The boy trudges through the snow pulling a makeshift sled behind him. Darkness is minutes away, but his merry-sounding whistles cheat the night of its shadows. He has no boots and wears a pair of threadbare socks in place of mittens, but he notices no deprivations on his errand this Christmas Eve. He spots the yellow glow of light spilling from the windows of Mac Sam’s General Store and aims himself and his sled accordingly. He pushes open the door and begins to unload crates of empty bottles. “Almost didn’t make it, Mac! Mr. See told me to come by there ‘cause he had a whole pile of bottles saved for me…and it was worth the extra mile,” he laughs and helps Mr. Sams count the empties. “Yessir! And mighty happy to have it, Mac!” The boy jingles the coins and rolls the dollar bills up in his fist as he orders food from a list in his head. Mac Sams gathers the boy’s items and leans on the counter to watch as the lad wanders through the store, looking at the Christmas toys and brightly wrapped candies and confections. Finally, C.R. comes back to the counter with six penny-stick candies, three brightly colored pencils, and a glittery box of Christmas cards. “These here cards, they look so cheery…I wonder how much they are, Mac?” The boy’s eyes gleam as he stares at the homey images printed on the box, and Mac steals a look at the price written on the bottom…$1.15. The proprietor puts the box on top of the flour and tells the boy all Christmas items are on sale: two for a quarter. “Hot diggity! Good enough…I’ll take ‘em,” the boy laughs. The two load the items on the sled, and calling out a Merry Christmas to Mac, the boy sets off in the dark, the soft slush of the sled lingering in Mr. Sams’ hearing long after the young man disappears in the night. Mr. Sams shakes his head and mutters, “His no’count Pappy ain’t coming home again this year…what gets into a man…leavin’ a twelve-year-old in charge of three little kids?” He sighs and flips the CLOSED sign over. The boy makes good time and enters the cabin where his siblings have been lined up at the window, watching for him. He grins as they dance around, waiting to see what goodies he’s brought home. Their eyes grow big at the sight of the eggs and bacon, and their mouths begin to water in anticipation. After supper, they sit in front of the fireplace, warm and sated. A few minutes past nine, he shoos his young sister and two little brothers off to bed, and gets the small gifts from their hiding place. He secures three battered socks with nails to the old mantel and fills the toes with the penny-sticks, the bright-colored pencils, and hickory nuts he’d gathered earlier. From the cupboard, he unwinds a length of string and stretches it from one side of the mantle to the other, looping the ends securely around the nails. Then he opens the box of Christmas cards and carefully places as many as can fit along the string between the socks. The sparkling glitter catches the fire’s glow, and he lies down with his head on his arms. He looks at each homey scene longingly, imagining his Mom alive again, and all of them together as in those warm and happy vignettes. He whistles a Christmas tune softly and closes his eyes with a sigh. “It’s gonna be a mighty fine Christmas,” he whispers. Author’s Note: I lovingly dedicate this story to my dad, who lived it as a child. My dad, Ray Thompson, went home to heaven tonight. 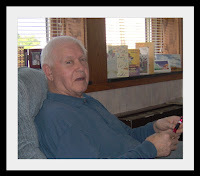 I'm so sad, and missing him already, but I am also grateful for the years he was my dad. He gave me love and acceptance, believed in me, and was always in my corner. He laughed with me, and loved my son, his grandson, Joseph, to the nth degree. Dad never met a stranger and had a twinkle in his eye and a story to tell anyone who came near. I loved everything about my dad. He knew the Lord. Worked hard. Loved his kids and family, and lived out his faith in practical and helpful ways. Dad knew everything about the woods and survival, and I often said that if I had to be stranded anywhere, I'd want to be stranded with Dad. He knew how to build a shelter out of wet moss and how to find food in a desert. The best thing about my dad was his smile and his laugh. I will miss that the most. No matter how bad things got, Dad found a way to smile. His childhood was terribly hard, but he smiled. He whistled his way through life. I don't want to say goodbye. I don't want to not feel his strong hands in mine. I don't want to not see his white birdie hair, or not hear him call my name. But I live with no regrets. 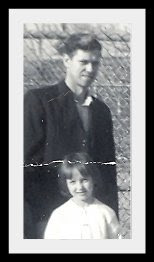 He was fully my dad and I was fully his girl, every day of our lives together. And in both of our hearts, that's the way it will always be. I love you, Dad. Muchly. See you in heaven someday! We were called back to the hospital at 1 AM last night, and it seems that Dad's journey to heaven is near. We were blessed to spend his birthday with him yesterday, and we're taking turns, as much as possible, to be with him today. Dad's remaining time is still in God's hands, but it does appear that his life on earth is beginning to wind down and his start toward heaven is imminent. Thank you for your continued prayers for him and for us. For specific prayer, we need to find a way to sleep, more than anything, in order to have the strength to support him and each other, and sleep has been in short supply with all of us these last few days. Pray for calm and peace and less trouble breathing for Dad, too. He still knows we're by his side--he still squeezes our hands once in a while. It's hard to say good-bye, but when we know he is going to a city that knows no sorrow or pain, no tears or sadness, we can rejoice! That peace that passes understanding is here for us now...what a blessing and a promise! 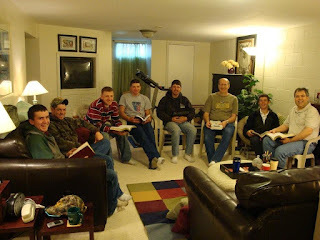 Last night my family and I went to Esther and Joe Keim's house for prayer meeting. This is the place we go to pray for each other and, most especially, to pray for the ministry of Mission to Amish People and for the ex-Amish. We usually break up into groups of three or four to pray. In my group last night was a 17 year-old young man who was just baptized on Easter Sunday. He had to leave home to be able to be baptized. He had to leave home in order to serve the Lord the way he felt led, and he had to leave home in order to accept Christ as his personal savior. And, he was Amish. His testimony brought tears to my eyes the morning of his baptism. He did not have a pleasant time of it when his parents discovered his hew faith. His Bible was burned. He had to walk for miles the morning he decided to leave his Amish community behind. Last night, his young face and shy manner went straight to my heart. I could not imagine how much courage and strength he had to have to make the decision he made. My own son is 16, and I can't even think of him having to leave home to start completely over in another culture! This shy young man bravely said his first prayer aloud in our group...his prayer was so sweet...his faith is so new...his life is so changed...and he needs so much prayer and support. When the Amish leave their communities, they often stay with other ex-Amish. They face a world of hurdles that our English kids can't begin to know. The ex-Amish often leave with just the clothes on their backs. They have no high school diploma to get them started in the work world, and they have spent much of their lives conversing in a language that the rest of America doesn't know. They need to get jobs, get their GEDs, get a driver's license, find a place to live, apply for a social security card, and just learn to function in a world that was closed to them before. Their tenacity and work ethic astound me sometimes. They need support and prayer. If you feel a tug in your heart to learn how to help these young people, please take the time to go Mission to Amish People, or contact me here and I'll be sure to get you linked to the right people who can guide you on how to get involved. In the meantime, please pray! I'm so proud of these young people who have worked hard to follow their God. To Maryann (way to go on that GED! ), Perry, Johnny, William, Johnny, Miriam, Barbara, Harvey, Eli, Rachel, Maddie, Ben, Mose, David, and all the others that are striving to start over, my prayers are with you and my heart is forever captured and changed by all of you! We've had to fight the birds for use of our back porch this spring. We have many little clefts and wreaths that are apparently quite appealing to the local avian creatures in our backyard. We took our time putting the net curtains up, and the birds have taken advantage of our sloth. Everyday, we end up shooing away another mama robin or, worse, pigeon. They leave little gifts for us on our porch here and there as they work on their nests, and they make me mad at them with their ungracious messes. Finally tonight, we have the curtains up, so we hope, when we go out in the morning, there will be no sudden flutter and chirp of warning to contend with on our porch. We left the robin's nest on the top of the floodlight to the side of our house. That mama comes back every year, and the only time she gets annoying is when her babies are ready to fly. She'll dive bomb us when we go to the water hose then. Or, if she catches us peeking at her out of the high octagon window that looks right into her nest (we use a step-stool to spy on the family), she'll fluff her feathers at us and fly menacingly at the window as she gives us a shrill lecture. I love catching the moment when the baby robins learn to fly. Their comic antics and wobbly edge-of-the-nest practicing make me smile. Though Mama robin is even more aggressive when the babies are starting to wing their way into the big world, the funny thing is, when they all fly off, she turns back into a normal bird and just ignores us. The nest looks so empty then and it becomes just another messy twig thing stuck on the top of our floodlight. Though Mama Robin is sometimes annoying in her screeching protectiveness, I always miss the birdies when they all move out. I only have to wait for next spring, though, and the nest will once again be full. 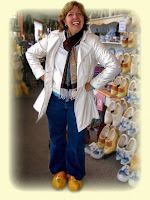 I'm so happy to hear that Robin Jones Gunn's latest book, Sisterchicks® in Wooden Shoes! will be arriving in stores on May 5, 2009. If you've never read this series, you're missing out on some fun reading! Here's a summary: "Summer and Noelle, two pen pals since 4th grade, meet for the first time in the land of tulips and windmills. An abnormal mammogram sends Summer on a quest to fulfill her lifelong wish before she begins the same struggle her mother fought against breast cancer. The story of these two Sisterchicks is brimming with hope and cheer and will bring encouragement for any woman who has faced a fearful future." I've read all of the Sisterchicks® books and they're among my favorites. So on May 5th, why not gather some of your best gal pals and make a fun day of it: meet at your local bookstore, buy the book, and then go have lunch--make sure you get dessert, too! Here's a blast from the past, and if you're too young to remember this ancient game show, forgive me! This was one of my all-time favorite shows. 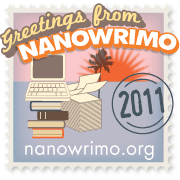 I wrote this silly piece when the FaithWriters Writing Challenge topic was "patience". Hope you enjoy reading it as much as I enjoyed writing it. And don't forget, to read more great fiction, or to add your name to the list to link to your own Friday Fiction, just click here: Sharlyn's Dancin' on Rainbows. It’s a snowy Sunday evening in 1956 and I’m standing backstage at the CBS Studio in New York, pinching myself because I just saw my favorite person, Bennett Cerf, walk onto the set…wish I could have two minutes alone with him in the Green Room. “Five minutes to curtain, everyone! Five minutes!” the director calls. I glance around, assessing my chances of going on first. The guy across from me is also a farmer…farms frogs, of all things. We’re told the most interesting occupation will go out first. I have my fingers crossed that I’m it. Suddenly, the bright lights come on, and the panel members make their entrances. The audience oohs and ahs over the ladies’ dresses and laughs like crazy at Fred’s introduction of Arlene. Then, Mr. Bennett Cerf is announced, and my heart flutters as he swishes past me. He bumps me just a bit and automatically reaches out to steady me as he says, “Oh, excuse me.” I die. He touched my arm! The game show gets under way as I tap my foot impatiently, waiting to hear who will be first. Wouldn’t you know it? That silly frog farmer gets to go before me! I listen as the panel stumbles through their questions. They lose because, of course, no one can believe that a person would actually farm frogs. John Daly flips all the cards over, and the man wins fifty bucks. Gotta listen carefully because my hero is speaking. “Uh…Sir, do you ever feel like you have a frog in your throat?” Bennett questions. The audience roars, and John has a coughing fit laughing out loud, but that frog farmer just says, “Huh?” He doesn’t get it! I shake my head in disgust. Just let me get out there…I hope Bennett says something witty to me…I know a good joke when I hear one. They break for a commercial, and when the countdown starts again, I’m ready and waiting for my cue…c’mon…the show’s clock is ticking down, and I just gotta get out there and shake Bennett’s hand. The director comes my way, but can you believe this? He’s pointing to the guy who makes glasses for chickens! The guy gives me a Cheshire grin and toddles out on stage to sign in. Oh man! The special mystery guest will be next…if they both bomb, I should still have time to get in on the last segment for the evening. I peak around the corner as the chicken optometrist strolls across the stage to meet the panelists. I’m envious when he shakes Bennett’s hand. Time runs out before they can narrow down his silly job, and Bennet throws his head back and guffaws as the man’s occupation is announced. I love Bennett Cerf. What a guy! Chicken man scoots past me on his way to the door, and I look around for the mystery guest. In the corner I spy a has-been actress, and I smile. She won’t be out there long…good, good, good. The actress struts out after the panel has their masks on. The panel takes forever to name her, and I begin to eye the clock…five minutes left! And then, I’m getting the signal, and before I know it, I’m sashaying out under the bright lights. I can’t believe it! John watches me sign in; and my fingers are shaking as I put down the chalk. He grabs my arm and pulls me to the desk…I have to sit down! No walk to greet the panel. No Bennett Cerf. Oh man! No! I scream inside…start with Mr. Cerf…Mr. Cerf! I dully answer Dorothy’s questions and then, Fred Allen’s and then, Arlene Francis’…maybe we’ll get to Bennett after all…the clock is ticking, and I see John glancing offstage to the director, who is making a slashing motion across his throat…wrap it up! “Well panel, I’ll have to flip the cards because we’ve run out of time. Miss Standford is also a farmer--a turkey farmer!” John stands and shakes my hand, and I barely have time to glance Bennett’s way as I exit…he’s smiling at me! I nod to him, and he nods back. Yes! Afterwards, I slosh my way through the messy snow back to the subway. I have a check in my pocket for fifty bucks and a silly smile on my face. Bennett Cerf…what a nice man! I sigh, and so personable, too. Labels: Friday Fiction, fun, old game shows, What's My Line?